These 12 students are among the many faces of Duke' University's Class of 2010. Duke tells their stories here to show how they and their classmates made their mark and helped fulfill the university's goal of providing knowledge in the service of society. Congratulations to the graduates and their families! 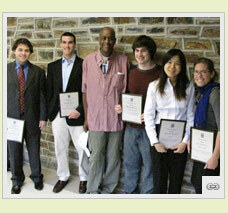 A partial list of honors earned by the Class of 2010 and other Duke students this year. On May 16, 2010, about 1,500 students will receive their undergraduate degrees from Duke University, with each crafting his or her own Duke experience. The dozen students profiled here illustrate the wide range of these experiences.